"This is the day which the Lord has made, the Feast of Feasts, and our Pasch: the Resurrection of our Savior Jesus Christ according to the flesh." With these solemn words the official calendar of the Western Church announces the celebration of Easter. Equally solemn are the words of the calendar (Pentecostarion) of the Eastern Church: "The sacred and great Sunday of the Pasch, on which we celebrate the life-giving Resurrection of our Lord and God, the Savior Jesus Christ." The joy and exultation over this greatest of all Christian feasts is evident in the writings of the Saints and Fathers from earliest times. Easter is referred to as the "peak (akropolis) of all Feasts" and the "Queen of all solemnities." Saint Gregory of Nazianz (390) writes, "This highest Feast and greatest celebration so much surpasses not only civic holidays but also the other feast days of the Lord, that it is like the sun among stars." This feast is called Pasch by most nations: Greeks and Rumanians (Pascha), Italians (Pasqua), Spaniards and Portuguese (Pascua), French (Paque), Norwegians (Paskir), Danes (Paaske), Gaels (casc). As stated before, this word is taken from the Greek (and Latin) "pascha" which comes from the Hebrew word pesach (passover). The Passover was celebrated by the Jews on the fourteenth day of the month Nisan, which began about a week before the full moon of spring. It was instituted to commemorate the deliverance of the people of Israel the night before their departure from Egypt. The angel of God destroyed the firstborn of Egypt but passed over the houses of the Israelites. It was the command of God, announced by Moses, that each Hebrew family should slay a young lamb without blemish, and sprinkle its blood on the frame of the door. In the evening the lamb was to be roasted, no bones were to be broken, and it was to be eaten with unleavened bread and bitter herbs by all members of the family. According to Divine ordination, this rite was to be repeated every year in a solemn ceremony on the eve of the feast, and is still celebrated by Jewish people everywhere today. Jesus observed it for the last time on the night before He died. There is a significant link between the Jewish Passover and the Christian Easter, because Christ died on Passover Day. It is also symbolic, because the lamb that had to be sacrificed for the deliverance of Israel is considered by the Church as prophetic of Him who is the "Lamb of God, who takes away the sins of the world" (John 1, 29). Thus the name and meaning of the Hebrew Pasch was devoutly accepted into the Christian liturgy. Although the death and Resurrection of the Redeemer would have been commemorated by Christians at whatever time they might have occurred, it is of special significance that the Lord actually did die and rise during the days of the Passover celebration. From the very first, the Resurrection of Christ was celebrated as the greatest and most important festive day of the whole year. In fact, every Sunday is a "little Easter" consecrated to the memory of the Risen Christ. In the Eastern Churches, Sunday bears the name "Resurrection" even today. The Council of Nicaea (325) prescribed that on Sundays and during Easter time all Christians should pray standing, never to bend their knees, to indicate "that we are risen with Christ." A relic of this custom is the practice of saying the Angelus (daily prayer commemorating the incarnation) standing, instead of kneeling, on Sundays and at Easter time. Most people are familiar with Millet's famous painting "The Angelus," depicting the peasant farmer and wife standing in their field at prayer. In addition to this weekly celebration of Christ's Resurrection, the Church has observed each year from the earliest centuries a special feast at the time of the Jewish Pasch, to commemorate the anniversary of the greatest events in the Christian world. Since there is an intimate bond between the Resurrection of Cluist and the sacrament of baptism, the Church united these two "resurrections" in a common ritual. She celebrates the "new life" not only of Christ as the Head, but also of his mystical body, his faithful followers. This is why the prayers of the liturgy in paschal week constantly reflect those two thoughts: the Resurrection of our Lord and the baptism of the faithful. The English word "Easter" and the German Ostern come from a common origin (Eoshlr, Eastur, Ostara, Ostar), which to the Norsemen meant the season of the rising (growing) sun, the season of new birth. The word was used by our ancestors to designate the "Feast of New Life" in the spring. The same root is found in the name for the place where the sun rises (East, Ost). The word Easter, then, originally meant the celebration of the spring sun which had its birth in the East and brought new life upon earth. This symbolism was transferred to the supernatural meaning of our Easter, to the new life of the Risen Christ, the eternal and uncreated Light. Based on a passage in the writings of Saint Bede the Venerable (735), the term "Easter" has often been explained as the name of an Anglo-Saxon goddess (Eostre), though no such goddess is known in the mythologies of any Germanic tribe. Modern research has made it quite clear that Saint Bede erroneously interpreted the name of the season as that of a goddess. Some Slavic nations like the Poles call Easter the "Great Night," (Wielkanoc); the Ukrainians, Russians, Serbs, say the "Great Day" (Velik Den). In Hungary it is referred to as "Feast of Meat" (Husvet), because the eating of meat is resumed again after the long fast. In medieval documents Easter is often recorded as the beginning of a new year, especially in France where this custom prevailed until 1563. At Easter time the Roman Emperors, starting with Valentinian in 367, released from prison persons who were not dangerous criminals; this practice was followed by emperors, kings, and popes all through medieval times and up to the present century. An interesting example is recorded in the diary of an English traveler of the seventeenth century. He reported that during a service at Easter time in one of the Roman churches he saw a boy seated on a chair next to the altar; the youngster was dressed in a blue robe, wore a wreath of olive twigs on his head, and held a burning candle in his hand. He was a lad of about fifteen who had been committed to prison for killing another boy, and by the Pope's order been freed in honor of Easter. Leading citizens in the Roman Empire imitated the clemency of the emperors at Easter time, granting freedom to slaves, forgiving enemies by ending feuds and quarrels, and discontinuing prosecutions in the courts as well. These customs, too, prevailed all through medieval times in the Christian countries of Europe. A reverent and endearing practice is the combined Easter greeting and Easter kiss. 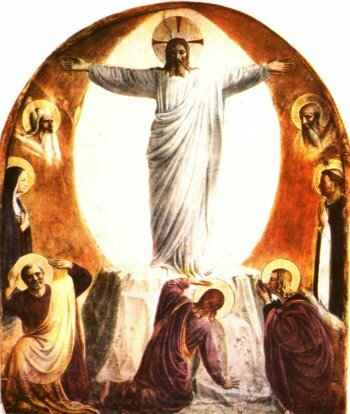 In the early centuries, the faithful embraced each other with the words, "Surrexit Dominus vere" (Christ is truly risen), to which the answer was, "Deo gratias" (Thanks be to God). In the Greek Church the greeting is, "Christos aneste" (Christ is risen), the answer, "Alethos aneste" (He is truly risen). This greeting is still generally used by the Russians and Ukrainians (Christos voskres--vo istinu voskres). In Russia the Easter kiss was bestowed during Matins before the night Mass; the people would embrace each other in the church. All through Easter Week the mutual kiss and embrace were repeated, not only in the homes, but also on the streets, even to strangers. The Poles and Western Slavs greet each other with the wish, "A joyful alleluia to you!" (Wesolego Alleluja). In medieval times, when the bishop celebrated Easter Mass in his cathedral and the clergy received Communion from his hand, the priests and ministers would kiss him on the cheek after Communion, according to the regulations. At Saint Peter's in Rome, on Easter Sunday before High Mass, the Pope embraces the three youngest Cardinals who meet him as he approaches the altar. Another ancient rite of Easter is the solemn Easter Communion. Church law requires the reception of the Holy Eucharist at least once a year, during Easter time. This edict dates from the fourth Council of the Lateran (1215). The law was not made to inaugurate a new practice but to safeguard the minimum demands of an old tradition. In the early centuries a great deal more was expected from the faithful than Communion only once a year. The Council of Agde (506), for instance, had urged all Christians to receive at least three times a year. In the beginning, the obligation of Easter Communion had to be fulfilled on the feast day itself. However, the Church gradually extended the time of this obligation, which now begins on Ash Wednesday and closes on Sunday after Pentecost (Trinity Sunday).